The game is simple, and can be adapted any way you like. We have played it with dice (actually, with just one die) with a side to match each color on the board. Some toy stores sell multi-colored dice and simple game pieces, but if you can't find any, a regular numbered die will work too. A multi-colored or numbered spinner will also work. You can use colored bottle caps (from milk or juice containers as shown) to match the spaces on the board. Or, each child can make their own game piece. Each player rolls the die on their turn. Play procedes in one direction around the board. 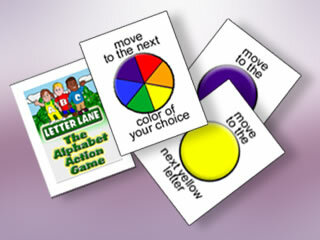 Whatever color the die lands on, the player moves to the next letter that has that color. For example, if the die lands purple side up, the player moves his or her game piece to the letter D. Then the player does some action beginning with the letter D (dancing, drawing, ...be creative!) and the other players try to guess the action. Then the next player takes a turn. We usually add a rule that if a player rolls his or her own color they get a second turn in a row. This is the only reason the game pieces would need to match the colors on the board. When does the game end? That's up to you. 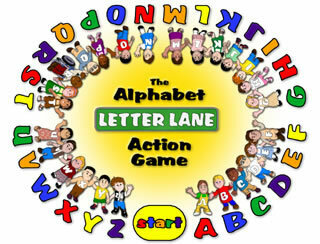 You might play until the first child gets to Z, or until all children have made it all the way around the board. Most of all, have fun, and use your imagination! The game board is also available as a high quality poster through CafePress. Click HERE to order. 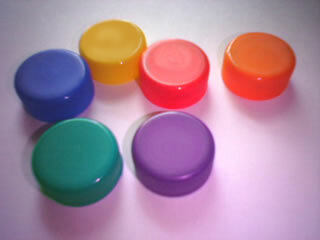 Multi-colored bottlecaps make excellent game pieces. Collect them from your milk or juice bottles.